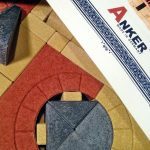 Where are Anchor Stones Made? Manufacturing of Anchor Stones takes place today in Rudolstadt, Germany, just a short walk from the manufacturing complex of F. Ad. Richter & Co. in the late 1800's. Here, the natural ingredients are mixed, pressed, dried, and packaged into sets for builders all over the world. This entry was posted in Lifestyle, Questions and tagged Europe, manufacture on August 16, 2016 by Kathryn Hertzler.